The Dividist Papers: It's the spending stupid. Long term - I don't have an answer. But I do know that right now we don't particularly need a plan to build a hospital for our critically ill federal budget patient. What we need right now is a tourniquet to stop the bleeding. Short term - Neither party can be trusted on spending. 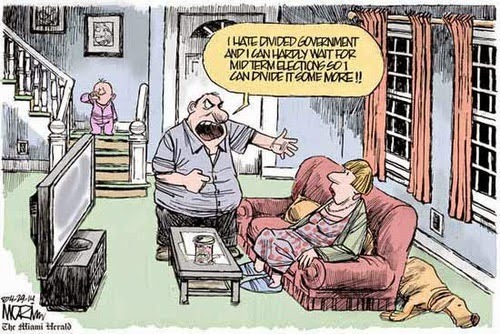 Divided government has been shown as a historical fact to restrain the growth of spending (as well as deliver other benefits) by scholars, political scientists, economists, historians, and constitutional lawyers. There is exactly one voting booth imperative for anyone concerned about spending - voting for divided government. This means voting straight Republican for federal office in 2010, and if they take Congress, then voting to re-elect Obama in 2012. Republican vs. Democrat is a false choice. 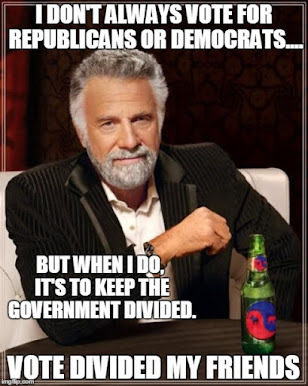 Divided Government vs One Party Rule is the real choice facing voters. I wholeheartedly agree with your premise that the two party system is a fraud, today. I'm new to this blog and haven't had the opportunity to find where you eventually want to go. ALL of our woes, financially, politically and socially are that our elected have not honored their oath to obey and protect the Constitution. This is not new and has really been accelerating the last hundred years by the establishment of the Federal Reserve in 1913. That private corporation owned by Central and private banking elites have controlled our economy and have created every up and down in our business cycles and have a hand in involving us in wars. I don't have time to elaborate on all the ways that our special interest ruled elected are trashing our Constitution now, but have a plethora of evidence on my blog, for those interested. Basically, our founding fathers created our Constitution as a blueprint of checks and balances that had ONE PRIMARY function....the protection of the unalienable rights and freedoms of the INDIVIDUAL! Free enterprise is the natural and best engine of exchange of values of free individuals and that engine made our nation the greatest in the world. The policies of the special interests that own our elected have seen to it's demise by greed for money and power. You see the results.... the answer is a return to the tenets of the original, organic CONSTITUTION. Many of the Tea party recognize this.